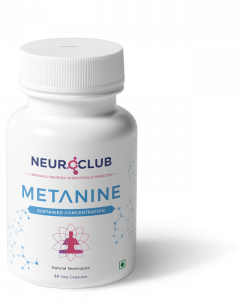 Metanine is the ultimate productivity enhancer that extends wakefulness in the brain. With ingredients that stimulate neurons, Metanine sustains your focus for longer by modulating this stimulation with mild inhibition. You will also feel more energetic and productive across the day. This natural nootropic even helps those with Attention Deficit Disorder (ADD) focus better. Ace your tests. Finish your projects faster. Stay focused. Your life is shaped by memories, those that are meant to be unforgettable. But, many of us are unable to recollect the exact happenings of cherished events. Xance helps with long-term memory support by increasing the availability of BDNF (brain-derived neurotropic factor), an extremely critical protein that helps strengthen the existing connections between neurons. Don’t fret anymore. Seraxil is an all-natural and healthy solution to combating stress and relieving anxiety. You can be your best at school, work, or with your family. Seraxil’s contents provide widespread inhibition of rapidly firing neurons that cause stress, thereby calming down your brain, so that you feel peaceful with a relaxed state of mind. Living on the edge is definitely awesome. But, the morning afters probably don’t make you feel glamorous. Myeliv relieves hangovers and combats the negative consequences that alcohol and junk food have on your brain and liver. Enkodin is a natural nootropic that boosts short-term memory. It enables neuronal connectivity that allows your brain to easily grasp new ideas, maintain memory and ooze with creativity! Enkodin consists of ingredients that increase 'new dendritic arborizations' in both young and adult brains. Whether you are in grad school or a software team leader, you can dramatically improve your academic or work efficiency. Miss those youthful days when you were outrageously creative and got more out of life? Now you can be just as good. Agilin recovers your mental agility and helps you think on your toes again. Agilin is also the only supplement on the market formulated for the prevention of dementia, Alzheimer's and Parkinson's.